Such a ridiculous change from last night – Comfort Inn and Suites at North Conway. We wanted somewhere to stay to break up out long drive to Vermont, and the Comfort Inn was reasonably priced. Dunkin Donuts in Lewiston, ME for lunch – we shared a grilled cheese sandwich. Burger King for dinner. The shame. I’m sure there are plenty of nice places to eat in North Conway, but we really couldn’t be bothered to find them! 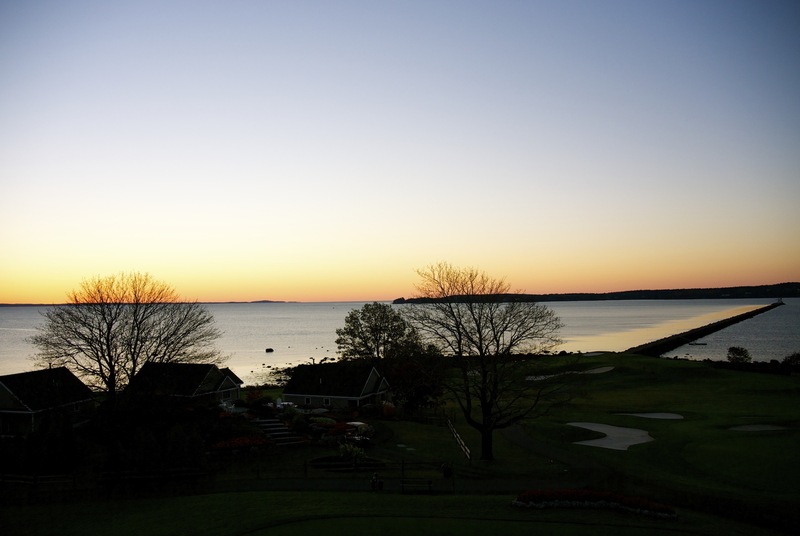 Once again, we caught the beautiful sunrise and watched it from our balcony at Samoset. It was amazing and it felt like we literally had to force ourselves to leave the room. I could have stayed here forever. We knew we had a longer drive today so we set off relatively early. We thought about getting breakfast, but we were so full from last night that we couldn’t face it. But before we started on the trek, we drove down the road to visit Camden Hills State Park. We had no idea if it would be open or not – a combination of the government shutdown and it being out of season – but we were assured by the front desk staff at the hotel that it would be. And fortunately, it was! 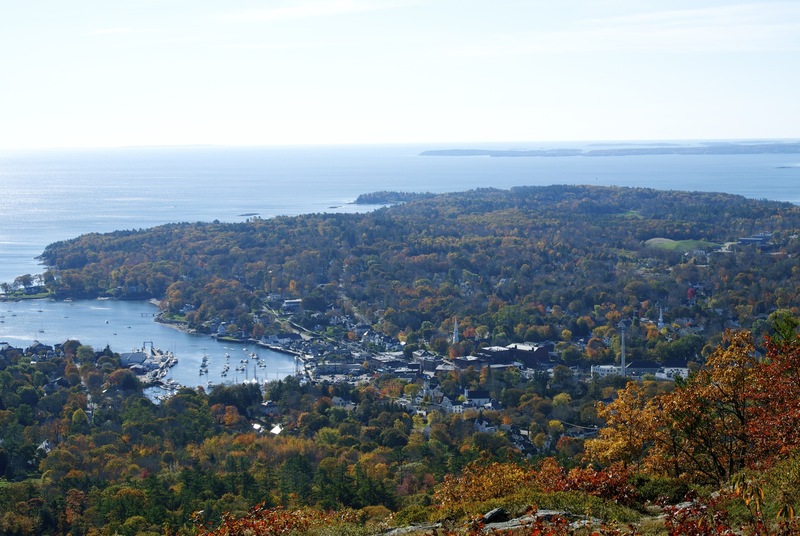 We drove to the top of Mount Battie and the views were stunning. We had a bit of a wander about, thought about going for a hike but realised we were up a very high mountain, and managed to spot Rockland Harbor light (which was the lighthouse by our hotel). We spent about an hour here before driving back down and onwards to New Hampshire. I felt a little bit sad as we were saying goodbye to the ocean for a few days, but I knew we would see it again. Maine is a big old state and it felt like an age to cross it! We stopped at a gas station in Lewiston – we had a copy of The Next Exit in the car which was so useful when finding places to stop so we knew what was at each exit and chose one had a Dunkin Donuts. Well, pretty much every exit had a Dunkin Donuts because they were everywhere but the Lewiston one was about halfway. Our cheesy lunch eaten, we spent another hour and a half on the road and parked up at Settler’s Green Outlet Village. Now I love outlet shopping, but Settler’s Green left me a bit cold – I much preferred Freeport, ME. It was really spacious and quite pretty, with mountains surrounding it, but I just didn’t like the shops. That said, I did buy four t-shirts in Old Navy, but that was mainly down to necessity as I was going to run at out clothes at some point! We went over to the Comfort Inn and checked in. 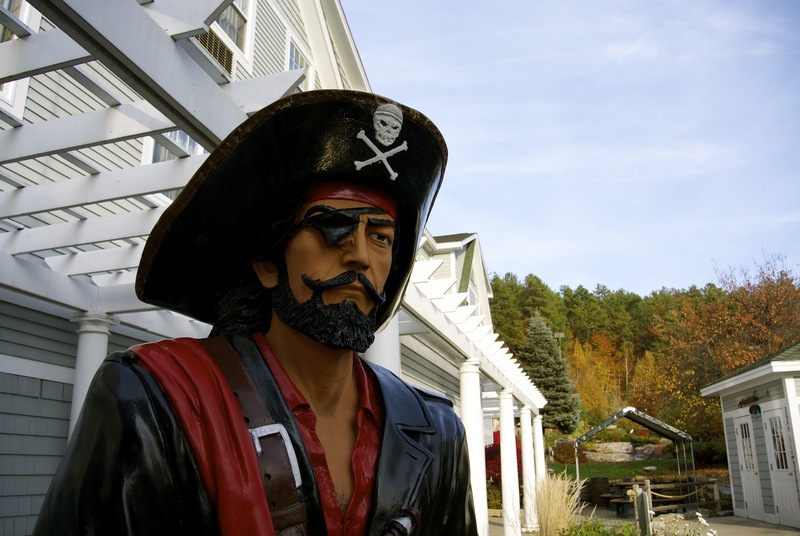 I got excited as there was a pirate mini-golf at the hotel, but it was closed!! Gutted. The room we had was quite big with a separate sitting room and it was perfectly decent, but my goodness I missed Samoset! We hung out in the hotel room for a couple of hours so Husband could refresh from the 3 hour drive, watching Ellen and the news. Not really wanting to think about dinner options, we drove down the White Mountain Highway and stopped at the first place we found, which happened to be a Burger King. A Burger King with a fire pit in the middle of it – a little odd! We filled up on free refills (Cherry Dr Pepper – YUM!) and got back in time for two hours of Dancing with the Stars. Also I saw the word Penobscot and had flashbacks to the con (last year, not one you were at!) where Woodward taught the whole audience the sixteen counties in Maine to the tune of Yankee doodle. Awww! I wish I’d heard it! We could have sang it whilst driving round Maine!